Around 2:45 a.m. on July 10 the suspects used a stolen pickup truck to power through the wall to gain entry into the store. “I don’t know what drove them to commit the offense in the fashion that they did,” said Edge. Thursday Waxahachie police with the assistance of Dallas police and the Bureau of Alcohol Tobacco and Firearms arrested Xavier Kirvin, 19, Virgillo Cherry, 17, Demarcus Dillard, 17, and Deontae Jennings, 17. Detectives are not releasing a lot of information at this time because the investigation is still ongoing. From left: Ardell Virgillo Cherry, 17; Demarcus Dillard, 17; and Xavier Kirvin, 19, all of Dallas were booked into the Wayne McCollum Ellis County Detention Center. Devon Deontae Jennings, 17, posted bond. Police have only recovered three of the guns that were stolen in the Waxahachie gun store robbery. Obviously just days after the horrific shooting of police officers in Dallas, Waxahachie police want to recover these weapons as soon as possible. 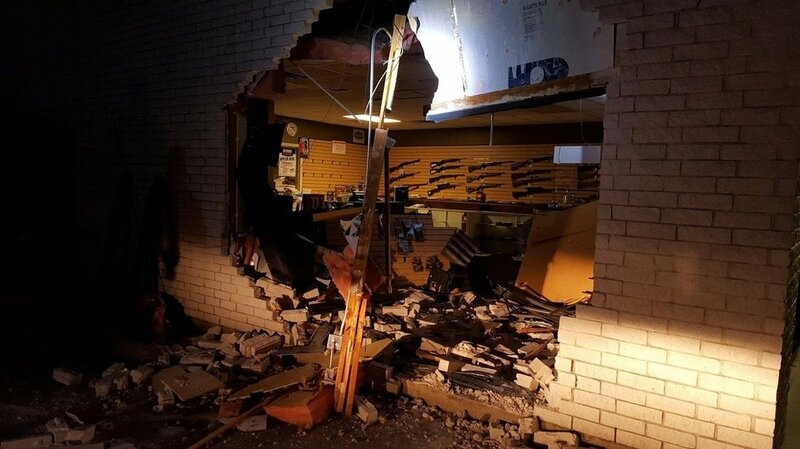 Due to the extensive damage, the Shooters Edge gun store will remain closed until repairs are made.